I have never before missed a flight, but this weekend I did. 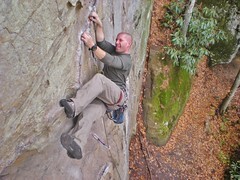 I was supposed to leave on a Wednesday night, so we could drive down to the RRG (Red River Gorge) on Thursday. 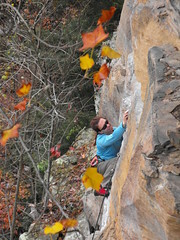 The plan was to climb a little Thursday, some on Friday, and then do the Fig adventure race on Saturday. Unfortunately, work had been so hectic that I was completely frazzled. I thought the race was the weekend after (during Veterans weekend), so I was completely unprepared for the phone call from Barry on Wed night. “Clare, I was waiting at the airport for hours. You never came off the plane. I went to the airline counter and they said you never got on the plane. You should be here and you’re not. What’s going on?”. I could not believe I messed up so badly. For a planner, this is hard news to swallow. How could I have let this happen? Lucky for me, there were still openings on the next flight. Of course, I had to pay an extra 150 bucks, but I was grateful to still be going. I had been looking forward to the trip for months…I mean, adventure races are COOL! 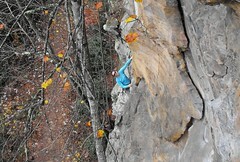 And, climbing in KY is my FAVORITE. In any event, I was a day late. 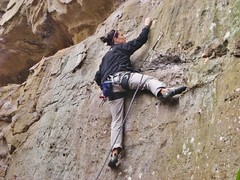 We still managed to climb on Friday. We went to some nice wall of moderates in Muir Valley and climbed half a dozen gorgeous pocket and crack infested sport routes. 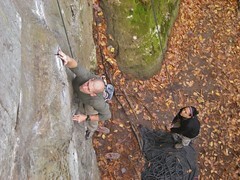 See the following pictures of myself, Clay, and Michelle having a blast on KY sandstone. 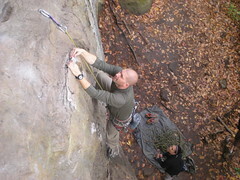 This entry was posted on Friday, November 4th, 2011 at 12:52 pm and is filed under Rock Climbing. You can follow any responses to this entry through the RSS 2.0 feed. Both comments and pings are currently closed.